Aug 17, 2015 (LBO) – The general election that took place today was the most peaceful and fair in the recent history of the country, Sri Lanka’s election watchdog PAFFREL said. “A total of 212 incidents were reported on Election Day, but none of them were of serious consequence. The police reported 35 arrests.” its Election Day statement said. The full statement issued by PAFFREL is reproduced below. The general election that took place today was the most peaceful and fair in the recent history of the country. The predominant feature of these elections was the deference given to rulings of the Election Commissioner by the government, contesting political parties and by the supporters of the political parties. This showed a real shift in power towards the elections commissioner who was not contesting the government to ensure that the law was implemented. The change was especially stark in relation to the election that preceded this, the presidential election of January 2015 in which violations of election law that involved the gross abuse and misuse of state resources took place on a large scale, including on Election Day itself. A total of 212 incidents were reported on Election Day, but none of them were of serious consequence. The police reported 35 arrests. There were a total of 1194 violations reported to PAFFREL during the campaign period and a further 129 violations during the two day cooling off period for a total of 1323 violations. Among the more serious were three killings. There were over 600 persons arrested during the pre-election period. The President suspended the services of the Secretary, Ministry of Postal Services after a complaint and direction by the Elections Commissioner. Allegedly the said Secretary had offered special election-related privileges within his department to a particular candidate. We appreciate the role played by the President in ensuring an environment in which the Elections Commissioner and Police Department were able to play their role with integrity. However, we also note the sudden action taken by the President in sacking the two general secretaries of the political party and political alliance he leads caused confusion in voters at the close of the election campaign. We note with appreciation the actions taken by the Election Commissioner using the powers vested by the 19th Amendment to the Constitution and other powers, and the deference given to him by the government, to ensure a free and fair election on August 17th. Steps taken by the Election Commissioner to issue guidelines and instructions to candidates and media institutions also contributed largely towards reducing the number of election law violations in this election. The Elections Commissioner ordered the removal of newspapers produced by state and privately owned newspaper companies during the two day “cooling off” period. We also appreciate the role of the Inspector General of Police and the Department of Police in maintaining a peaceful atmosphere that reduced election law violations. 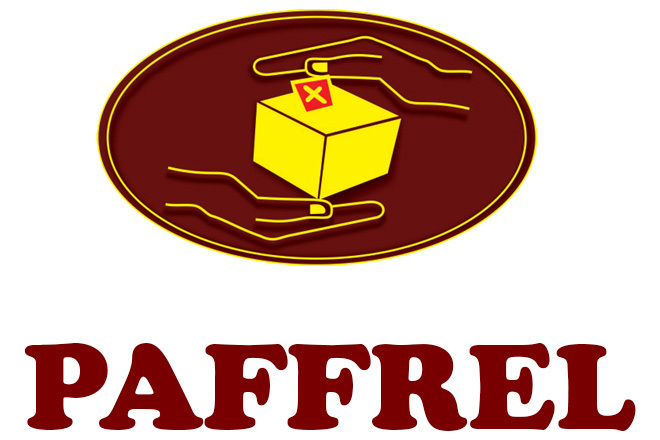 In areas such as Musali in the Mannar District and Kattankudi in the Batticaloa District, officials belonging to these two departments exerted every effort to maintain free and fair conditions for the vote. Although 1323 incidents of violations of election law were reported by PAFFREL during the campaign period, most were not of a serious nature, and were rectified by the election commissioner and the police. They took action to remove election posters and cutouts that were put up in contravention of the law, and arrested over 300 persons who were violating the laws. The political parties also gave their full cooperation without trying to challenge the election authorities. This paved the way for a credible electoral process. PAFFREL took measures to deploy stationary monitors at all 12,314 polling stations. In identified risk areas, measures were taken to employ 25 special vehicles for monitoring. Another 335 vehicles, each containing 4 expert monitors, were deployed in all the Divisional Secretariats. 13 foreign monitors from Asian countries and who have worked with internationally acclaimed election monitoring organizations such as ANFREL assisted PAFFREL. Post-election monitoring duty will continue for two weeks after the end of election. Civil society took an unprecedented interest in supporting election monitoring groups and in advocating for free and fair elections. The March 12 Movement campaigned vigorously for the political parties to nominate clean and honest candidates and urged that voters should cast their vote only for such candidates from their political parties of choice. We recommend that the next Parliament should consider ways of enforcing limitations on campaign finance to create a more level playing field, an advance voting system for those with disabilities or who cannot vote on polling day, providing the vote for migrant workers abroad and increasing women’s representation in elected bodies. There is also a need for the Election Commissioner’s Department to work together with civil society to educate the general population about the electoral process and the deepening of democratic culture in the country.